I've actually abandoned a couple of my original affiliate store sites for that very reason. They were just too high maintenance the way they were done. DataFeedr works with a variety of networks and merchants, using datafeeds to import products into your WordPress-based website. I've used similar import software in the past, but all it did was import - it did not update the feeds. Another feature I really like is that you can work with multiple merchants, and even display price comparisons for each product, giving your visitors the best possible deal on the products they're interested in buying. DataFeedr integrates 33 affiliate networks with over 11,000 merchants and more than 260,000,000 products. You can select the merchants you're approved for, and the specific merchants and products you want to promote, in your affiliate store. * To see the networks & merchants you can work with, click here then click Tour > Networks & Merchants from the top navigation. Note: Datafeedr DOES NOT take a percentage of your commission! While some affiliate store builder programs do (up to 25% even), Datafeedr doesn't. You pay a fair flat rate of $27/month to use the software - period. Facebook Integration: Add an Affiliate Store to Facebook! See firsthand how DataFeedr works by watching their extensive list of Video Tutorials, or just browse the topics even to get a basic idea. I used to LOVE working on my product based affiliate sites, and DataFeedr looks like the ideal solution to the datafeed issue (manual updating) that frustrated me so much before. So much that I put them on the back burner for awhile. I'm excited about getting them up & running again! The main reason why I did not go the affiliate store route in the past was exactly because of what you said, Lynn. I remember trying to use WebMerge (on more than on occasion!) and would get totally lost. This looks really good, though! Yes, it was quite the headache - I've used that too. 😛 I'm really excited about trying out Datafeedr and getting my affiliate stores back up and running again! I am based in the UK and have a .com a lot of my daily traffic is from the U S so how do I put links for the UK visitors to buy and the US customers to buy, do I show a link to both countries or is it better to concentrate on just one country? Good question, Rob. I don't believe they offer IP-based geo-targeting functionality, and I'm not sure if you can use a drop down and/or include both currencies. I would definitely contact support and find out, just to be sure, as they are adding new features all the time. Given your domain is a .com with a lot of US traffic, I would use the USD currency by default. If you are post-dripping, you can go in and edit those posts to include other currency links, but there may be an easier way. Great post Lynn! What are you doing or planning to do to drive traffic to these type of sites? This is jsut another one of those money wasting things. $27+ per month for what? Amazon, ebay and many Affiliate sites (AffiliateWindow.com, commissionJunction.com) etc, already give this option. Then there are sites like skimlinks.com ... all for free. So grab a hostgator or 1and1 or godaddy hosting account for $6-7 per month, grab a WordPress blog software for free, then join ebay's affiliate program (officially called: ebay partner network), or amazon's affiliate program or join skimlinks.com for nothing. Get on Youtube where there are tons of video's on how to use WordPress, ebay affilaite program scheme, amazon affiliate program scheme etc, etc. I see no value in this at all! The problem with managing multiple merchants manually is that the data changes constantly. 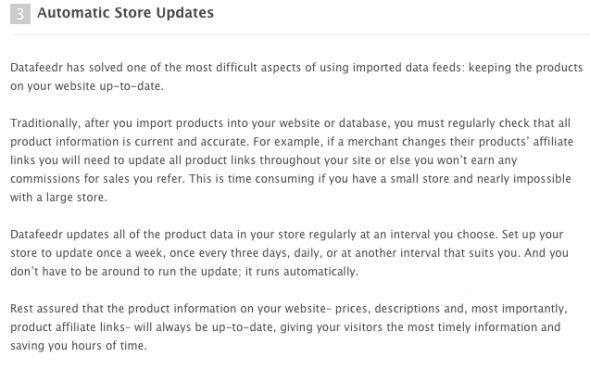 Even if you use a datafeed and import all the current data, you have to constantly import it to make sure it's up to date with correct products and pricing. Also, every datafeed is set up differently, so working with multiple merchants gets even more screwy. Not to mention there's no way to set up the price comparisons from multiple merchants on a single product like there is with DataFeedr. While you can manually create an online store style affiliate site (I've done it!) and you can manually post deals & specials, it's outdated within a month - or 90 days. And it's A LOT of work. DataFeedr takes care of both of those issues, plus gives you tons more features that allow you to better serve your market with a variety of products & merchants, plus current deals & price comparisons. There's just no way to do that manually - and stay on top of it. With DataFeedr you can create & update the site (updates are automated) with a wide variety of merchants and products. Then all you have to worry about is creating content, dropping in product widgets, doing simple site edits, and of course marketing. p.s. Just to give you some more insight, given my personal experience, merchants shut down or switch networks - making your whole site invalid (or the parts that rely on that merchant). Prices change, and you can get booted from the affiliate program for displaying inaccurate pricing. Posting each and every product individually is a HUGE job, and is often outdated before you even finish creating the entire site. Super! that is a huge,huge tip, taken from someone who looked at all affiliate stuff and thought - god, there goes my weekends! (joking). Thank you Lynn Terry for the info and I just might approach Affiliate life with a new perspective thanks to you. Thanks for the info about datafeedr. I recently spent (wasted!) a ton of time trying to figure out how to integrate price comparison charts on a new wordpress site. I've never done this before, so I was actually surprised that there aren't more options out there. I'll probably use datafeedr in the future. For now, until some money starts coming in, I'm going to try CompariPress. It's a wordpress plugin that pulls product info from Amazon, Linkshare, CJ, and a couple others, and updates price info automatically. Not free, but it's a one-time payment which works better for me right now. Comparipress.com if you want to check it out. Does anyone know if there are any other plugins or one-time payment options out there that do this? Great find! It's a cool plugin for sure, but it only works with 5 affiliate networks. And it just adds them into your posts - it doesn't actually create an online store or drip content (posts) for you. So you'd need to create the store and/or create the product based posts yourself. That would be ideal. Would those types of sites rank quickly enough to get at less one sale in your first month? And, would you post any articles for content or just let short product reviews be your content? I would use social media, video, content marketing, write blog posts, and basically a typical "marketing strategy" to achieve that goal. All of which would ultimately help with rankings too of course. There are so many ways to get traffic, specifically targeting buyers in this case, besides search traffic - which is especially helpful when first launching a site. Yes, you're right. The plugin has its limitations. After the first year, I think Comparipress is $49/year for updates. If this new site is successful, I'll probably not use comparipress after the first year, and switch to something like Datafeedr -- watching the videos, it's definitely more robust. I would consider CompariPress a decent option for someone (like me) wanting to get started without a monthly commitment. If I had the $27/mo. to spare right now I'd definitely go with datafeedr from the start. Sounds a great tool Lynn. Will try to check them out as well. Thanks for the wonderful post! Nice share! This is definitely an interesting tool! Thanks for the great info! Lynn, That data feed looks awesome I have one similiar from SellFire. It sure makes it easy. If it can pay for itself and then some it is worth it and the time you save is invaluable. I will be bookmarking this post, thanks! I would be keen to see if anybody is not having difficulty with this being slapped by google? Surely they class this as a "thin" affiliate site? I have a few sites using Datafeedr and I must say, once you get to know how to use it, it's pretty neat and fun and can even become addictive! As Lynn says, there are other competitors out there but nothing comes close to the professionalism of Datafeedr... the only problem is actually finding the perfect 'niche' to sell to which is not always easy. Actually Danny, I think Google doesn't dislike Datafeedr because they index my sites regularly and I have quite a few visitors. The beauty of Datafeedr is that you can change the product's names and description and really make them original so you don't have the exact same website as the next door neighbour! Almost two years later, are you still using this software? Is it still working for you or have you moved onto something else? If you are, is it possible to have a look at one of the sites you are using it on? Mahalo nui, Lynn. I am not currently using Datafeedr or any programs or setups for an affiliate site, but rather prefer content based wordpress sites for affiliate marketing.